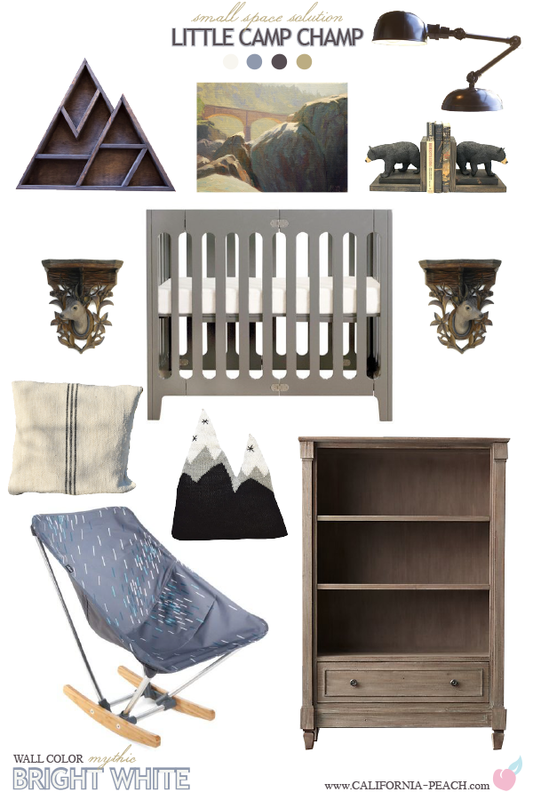 This pint sized nursery really packs a wallop with it's rustic bold decor and rugged masculine camping theme. Perfect for those of you who are working with a small space, and perhaps a smaller than desired budget too, but with just enough decor to welcome your little one in style! Just want to point out a few things I LOVE about this board! First, let me point out the gorgeous original fine art, "A Rock's View of No Hands Bridge," by Frank Ordaz. Frank is a local artist currently working in Auburn, California. We had the privilege to visit his studio space last year, something I recommend doing if your in town! Frank's artwork is incredible, we are lucky to own a small field study like the one above. View more of Frank's art here. You can also read an article I wrote on my Studio Blog about Frank recently here. Can you believe how gorgeous is this packable camping rocker from REI?! Can't beat the price especially for the versatility; bring it with you on your next camping adventure too! This one in particular reminds me of shooting stars. The rocker is not the only thing that's packable here: check out the mini-crib! The one shown here fits baby just about the whole first year, if you want it to last longer you can size up to the papa or max, all three sizes fold up for easy storage. I love task lamps, the one used here is especially gorgeous. The last thing I want to point out is the inspiration for this board: the absolutely gorgeous Luxury Knitted Alpaca Mountain Pillow, created by one of my favorite shops, Juniper Wilde. 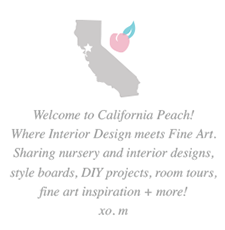 You're in luck because California Peach readers receive a special 30% off discount promotion right now, when you enter the code MINILAUNCHPARTY on at checkout! Just love this rustic mini space, hope you're inspired!